Yosemite National Park, flagship of America’s National Parks. Only a few hours from San Francisco, Yosemite is a magnificent wilderness that will complete your trip. Posted in Top 10 Deals, Yosemite Park Tours. 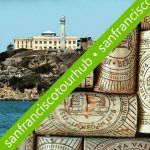 Discover America’s tallest waterfalls, biggest trees, cliffs rising 4,000 ft from the valley floor, and some of the world’s most famous rock climbs. 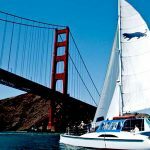 This experience of California’s great outdoors is not to be missed! Hailed as the “crown jewel” of the Park Service, Yosemite National Park is truly a breath of fresh air. Our Yosemite Day Tour allows you to spend 5-6 hours in this amazing park. 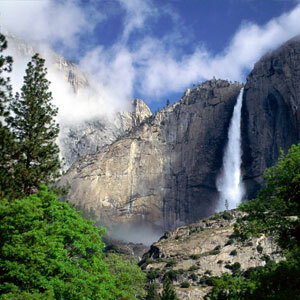 A 1 1/2 hour guided tour that focuses on the rock formations and waterfalls of Yosemite Valley is included. Some of the highlights of this tour are Yosemite Falls, Bridalveil Falls, El Capitan, and Half Dome. Our small group size provides more freedom and flexibility in the park than you’ll find on large bus tours. The day begins with a hotel pick-up between 6:15 and 7 am. 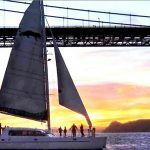 Heading east across the San Francisco-Oakland Bay Bridge offers great views of the San Francisco skyline, Alcatraz Island, Fisherman’s Wharf, and the Golden Gate Bridge. En Route to the park we cross through the Central Valley, where we will stop at a fruit stand for some local produce. Famous for its rich volcanic soil, the Central Valley is the largest agricultural region in the United States. The section we drive through is best known for specialty fruits and nuts such as almonds, walnuts, cherries, and strawberries. After this quick rest stop, we enter the rolling foothills of the Sierra Nevada. Continuing into the mountains brings us to California gold country and the gold rush town of Groveland before we wind our way into Yosemite National Park. Maps in hand, we begin with a one and a half hour narrated tour of Yosemite’s glaciated valley. 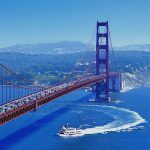 You will see famous waterfalls and rock formations including Yosemite Falls – the tallest waterfall in North America – El Capitan, Half Dome, Bridalveil Falls, Sentinel Dome, and much more. During the tour you will see Yosemite Valley from a number of great vantage points, the best of which is perhaps Inspiration Point. At 4,500 feet above sea level, this viewpoint gives you a commanding view east up the valley. Yosemite is a mecca for rock climbers, and the sight of people climbing El Capitan’s 3,200 ft. (1000m) sheer rock face is quite amazing. 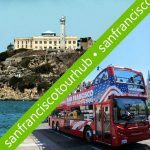 Because of our small group size, we can incorporate multiple photo stops into our tour so you can better enjoy your time in the park. After the tour, we stop for the afternoon near the base of Yosemite Falls, where there are a variety of options for lunch (not included). After eating, you will have 3-4 hours of free time to explore the valley as you choose. 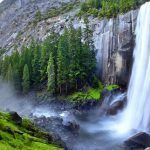 You can walk to the base of Yosemite Falls, check out the visitor center, visit the Ansel Adams Gallery, stop in at the Ahwahnee Hotel, rent a cruiser bike, or hike some of the trails that originate from the valley. 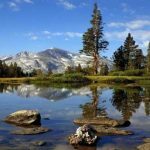 Although you could spend three weeks in Yosemite, the three hours you get on your own is enough time to understand why Yosemite is one of America’s most popular national parks. Regrouping again in the late afternoon, we head for San Francisco, stopping for a short break before arriving back in the city and dropping you at your lodging between 8:30 and 9:00pm.